Once upon a time, I had a 22 course tasting at Brooklyn Fare Chef’s Table. No, that’s not a typo. 22 courses. By the 10th course (and a bottle of wine), I was having a pretty hard time keeping track of what we had eaten. Only one course remains in my mind. Smoked caviar served under a cloche. It was not only delicious but I loved the drama of the smoky reveal. Fast forward to 2013. 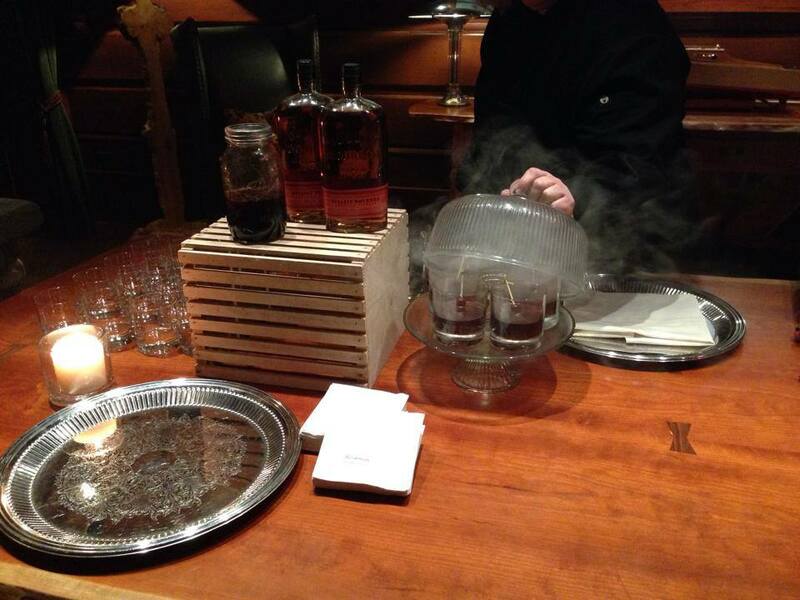 I had the great pleasure of staying at Lake Placid Lodge and witnessed the making of this smoked Manhattan. Maple chips were flavored with Cardamon, Vanilla Bean, Cinnamon, Maple Syrup and cloves. And the bartender smoked her own cherries for the garnish. Bravo, Lori. You truly earn the title of “Mixologist”. Now here we are. 2015. Sadly, smoking has not caught on in the world of private events. Until now. While working with Olivier Cheng on a wedding menu for The New York Public Library, he mentioned his recent trip to Spain and well, one thing led to another and we proposed this dish to Marianna and James for their first course; Chamomile smoked cloche with compressed tomato royale, buratta sphere, basil seed, and heirloom tomato water poured table side. Encouraged by our new found smoking success, Olivier recently proposed some of the most exciting smoked drinks for an upcoming New Years Eve speakeasy party.